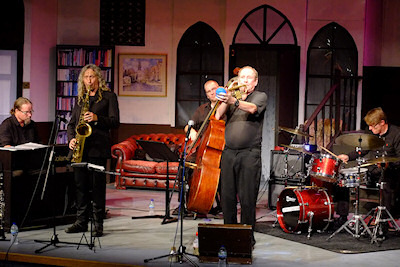 The summer heatwave may have abated of late but for the members of Newport Jazz Club the music was hot with the return of island favourite Digby Fairweather with his Quintet. Sharing front line honours were Julian Marc Stringle (clarinet and saxes) and Craig Milverton (piano) whilst strong back line support was provided by Neil Bullock (drums) and Al Swainger (bass). Opening with a hard driving version of the Rogers and Hart number "This Can't Be Love" the audience were soon swinging along to a set that referenced a homage to Nat Gonella and in turn gave each member of the band a chance to extend themselves. Particular features that went down well with the audience were a vocal rendition by Julian Marc Stringle, which he introduced as his 103 year old nan's favourite, of "I Can't Give You Anything But Love" and a rousing finale of the Duke Ellington number "Take the A Train". Digby himself was in fine form on both vocals and trumpet and several audience members were heard to say how much they had enjoyed the concert. The next concert will be on Sunday 16th September 2018 when the club welcomes back the Alan Barnes Quintet. Tickets are available from Gerry Cullis on 730601 or from Bill Wills on 523879.